In stock -This product will ship today if ordered within the next 1 hours and 53 minutes. 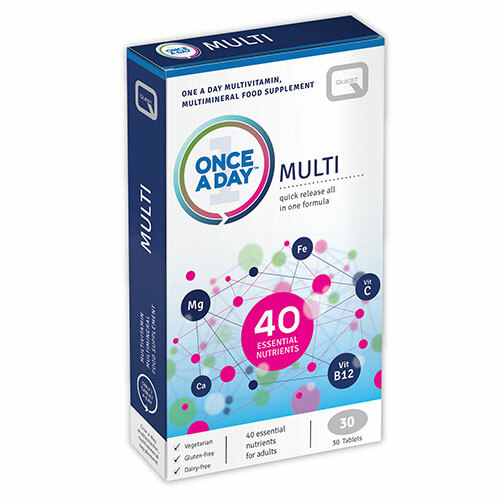 Quest Once a Day - Quick Release Multivitamin is for general health and wellbeing. Helps even healthy people meet nutrient requirements. Dicalcium phosphate, Microcrystalline cellulose, Multimineral amino acid blend (calcium carbonate, magnesium oxide, ferrous sulphate, zinc oxide, manganese carbonate, copper sulphate, potassium iodide, sodium selenite, chromium chloride, sodium molybdate complexed with citric acid, glycine, rice flour, rice protein complex, sodium hydroxide, sodium citrate, aspartic acid and maltodextrin), Ascorbic acid, Citrus Bioflavonoids, Lysine HCl, D-alpha tocopherol (soya), Calcium pantothenate, Nicotinamide, Choline Bitartrate, Inositol, DL-Methionine, Lecithin (soya), Para-Aminobenzoic Acid, Croscarmellose sodium, Beta-carotene, Thiamin, Pyridoxine HCl, Betaine HCl, Riboflavin, Retinol palmitate, Magnesium Stearate, Vitamin D3 with Arabic gum, dl-alpha tocopherol, tri-calcium phosphate), Mixed Carotenoids, Papain, Rutin, Vitamin B12, Biotin, Cysteine, Folic Acid, Methyl cellulose, Silicon dioxide, Sodium ascorbate, Corn starch, Glazing agent: Hydroxypropylmethylcellulose, titanium dioxide, stearic acid, Microcystalline cellulose. This product contains iron which, if taken in excess, may be harmful to young children. Keep out of reach and sight of children. Long term intakes of this amount of B6 may lead to mild tingling and numbness. Do not take if you are pregnant, likely to become pregnant or breastfeeding except on the advice of a doctor as it contains vitamin A. 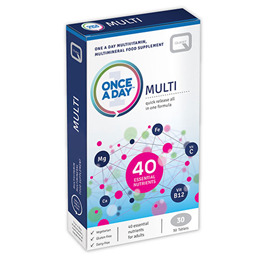 Below are reviews of Quest Once A Day - Multivitamin - 30 Tablets by bodykind customers. If you have tried this product we'd love to hear what you think so please leave a review. Good quality vitamin but for me and my partner who have difficulty swallowing large tablets these are quite large and not easy to go down in one. So I place the tablet in a plastic sandwich bag and cut it into 3. This makes it go down much easier . But I do prefer the soft gel outer coating on tablets where there is never any problem. If honest I am not sure I would buy again but only because of this element. I normally like everything that bodykind sell... great company to deal with and service is always excellent. Good product excellent quality only buy Quest.